Pteranodon Flyers is a swing ride in Jurassic Park at Universal's Islands of Adventure. Readers say... skip it. The minimum height to ride is 36 inches. 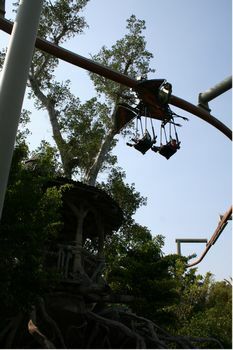 Board a flying swing, suspended under the wings on a pteranodon, for a two-minute flight above Camp Jurassic. Visitors more than 56 inches tall must be accompanied by a child between 36 and 56 inches, and vice versa. Currently, this and Harry Potter and the Forbidden Journey were the only two rides in the park where you cannot use a Universal Express pass to skip the queue.